When things are good and youza don't wanna ever furget it, youza calls that Unfurgettable, and me and myself shure had that kinda week. And it wazza brilliant fog free week (my fur stayed nice and purrfecto in place). Fine time to shop and drop in to da abundacat BowTeeks, while purrancing our famoso furiendly paws around San Franfuncisco! Definicatically, it was a sentimentacatical journey when my gal pal went shopping with me, the Italian Kitty. Weeza "Insepurrrable" shopping duo cuz we brilliant furiends think alike! CATZOWEY I'ma humming and strumming my catichords to keep up with her meowvaloso mewsikal self. But shhhh, dontcha tell - I let her hum while she wazza purrrusing da purrty clothes and I just purrred in her catzowey kitty carrying cashmere arms. Ohhhh I wazza having da tsunami of purrs! Suddenly she said " This Will Be feline fine Guido" and faster than me and myself can pop a Friskies pop top can, she put me in this deeziner bag and told me "Guido dontcha worry honey cuz you're a "Mister Meowster Melody"! Ahhh sheeza saying da mewsik to my meowster ears. Then we dashed off to another BowTeek where weeza meeted and greeted abundacatically by nice feline furiendly folks, whooza contentacats to see us both! Hey! Itza me and da BeeYouTeeFull Signorinas from da Fillmore Street BowTeeks. Theyza just going bonkers over having da EyeTailYun man cat in da purrrty girl BowTeeks. NOWza MEOWza, I'ma feeling da urge to get up close and PURRsonal to some fine purrrrilliant jewelry and gottza check out da ringy dingy ding ear ring my purrsonal very speshule shopping pal izza wearing- AttenZeeOhKnee: always take time frum yur catnap to be checking ins and outzas to make shure da jewels moves to the groove . Itza always impurrtant to see thru da earring in both direkshuns cuz da Purrrpurrrazzi izza gonna have their flashie bulbs popping in all direkshuns. Phew I'ma exhausticatted too so I'ma gonna walk my baby back home and remember my Unfurgettable day in the City by the Bay. I wishes you an Unfurgettable week and make it a nonCATastrophic one too! Do I look like me and myself is trying to figure out what's going on? Yep uh huh, I'ma definicatically doing that fur shure, and for a furry good reason. Cuz I cannot believe what I saw and am seeing! CATZOWEY! I discovered the most meowvaloso gadgacat gizmo on the whole planet and youza gonna wanna pay attenZeeOhKnee to this news and mews, whether you read it Up side or Down side - no difFURence! Dontcha worry - this izn't someone's TooPay that went astray - it's really my fur for shure! I just got brushed and smushed by "Shed Magic" the fabucatulous cat de-shedding tool. I tellza youza - it's fantasticatical and I'ma feeling light weight and great without having to cut my carbs and diet which can cause me to riot. More good news and mews, it'za affurdable. I thinks my MasterCat Card had da charge of about $19.00 - not EUROs but da real envirocatical green bucks! Lemme check out this former mound of me .. one meowment I'm feeling hefty and da next meowment I'ma looking more buffed! Youza tooza can get this fantasticatical device via my favorito Pet Boutique Cheengoo in San Francisco. And psst! Secreto ..if youza tells Liz, da meowvaloso doggone great PURRprietor that youza FOG "Friend of Guido's", youza purrobably gonna have it mailed to youza fur affurdable cost - cuz sheeza da cat's meow even though sheeza da momma of da doggone adorable Abbie da dog! Wishing you a FURiendly week with no bad fur days! Woo hoo I'ma gonna have a light weight nonCATastrophic week NOWza MEOWza! Yep uh huh, I got da Green House effect - nothing is normal and I'ma seeing green green and more green in the scheme of this week. And abundacat GREEN words is jumping out at me and myself: Green Pesto, Greenhouse, Green leprechauns, Green eyes in disguise, Greenskeeper and Greenies. AND my purreening greening self izza humming the ol' tune "Green Acres is the place to be..."
Categorically speaking, my Celebricat self mingles and jingles in The Greenroom of Hollywood TeeVee studios - that's where da PurrEyeVat cat chats andza lounging around happen befur the Celebricat hops on the stage to woo hoo fans, and there's no green in dat color scheme of the Green Room cuz it's always blue or yellow - fur shure the only green in the Green Room is my EyeTailYun eyes. Make it an over the top week. Oopsatini! I means to say, make it a Top O' the Week! Shuksatini da Green is having an effect and itza infectucatulous! Me and myself izza trying to say "Happy St Paddy's Day"! Shuksatini - A Treasure Hunt For The Greenie! Green is popping up all over (but not in my Meowny Market Account). Soon it's March 17th when everybody's a little bit EyeRish - and some folks even gonna be a little green the day after (they purrobably wishes they'd not purrtended they wazza EyeRish). This week, I'ma out andza bout hunting and scrunching to find da EyeRish eyes are smiling Shammyrocks - yep itza Treshure Hunt fur da great good furtune greenies. Youza wondering why an EyeTailYun kitty izza on da search fur da organicat 3-leafy clover? 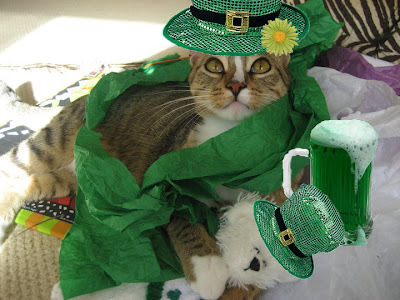 Cuz abundacat good furtune comes to those who find a crop of Shammyrocks. My EyeTailYun eyes found da furst EYErish Shammyrock owned by a little Leprechaun - hmmmzalini, anybody ever heard of a giant oversized Leprechaun? Creative creashun idea from da Oscar winning dippity do Deeziners: wear a disguise to show off my 'When EyeTailYun Eyes Is Smiling" eyes - yep uh huh, itza my EyeRish Bowl Em Over Tie and it works cuz I finds another Shammyrock! Itza safe to say thizza izza my good luck tie and purrhaps more furtuitous than a green pesto pizza pie! I mean, ONLY fur this week! Oh Catzowey! Me and myself izza seeing expando-double-duo ShammyRocks! Dontza ask da Martha Whoosit bout setting da correctacat EyeRish table - aska me! Cuz da smitten kitten from EyeTailYa always has da purrfecto hospawtality ideas. And fur shure, itza good to serve yur guests abundacat platters of food, send dem out da door with pawty favors of impurrted FUResh green nip, and wish them all a Pawsatively Happy and nonCATastrophic Shammyrock Day! Me and myself izza exhausticatted from 2 weeks in Vancatcouver where I pawsatively had da bestest time of all my 9 lives, and yep uh huh, I'ma podsledding home to CalEyeFurKneeYah where I can relaxacat and get my over skied-outski meowscles all relaxed with a meowsage at da spa. Itza not easy being an athleticat! Didja hear the OH-Lympicks Committee izza purrpondering adding new competicatitive 2014 Categories? Hummmmzatini I shure hopes they might have "Cold Weather Catnapping" as a Category cuz I'd excel in dat - itza fur shure go for da gold! "Ledge-Luge" would be an OH-Lympicks sport that interests me andza I'd definicatically win a Gold fur shure cuz my EyeTailYun self gotza da meowscles fur fine feline supurrrrt on da ledges. Not everyone knows exacticatically how to wear da heavy Gold Medal propurrrly but I gotza 4 yrs to purrractice and uncover to discover "is the GOLD MEDAL really gold? Don't have a hiss fit but I tells ya, there's a smitten kitten chance there's purrhaps more silver than gold in da Gold Medal. Seems I'm heading to da week of abundacatnaps but wishing YOU a nonCATastrophic week! Shhh, I gotza secret fur you, an inky dinky tidy box bit: no matter whooza youza cheered on at da OH-Lympicks isn't impurrtant. Itza just impurrtant you cheered on da fantasticat meowvaloso athletes of da world! Viva di Athletes and theyza ALL winners in my meowster mind.